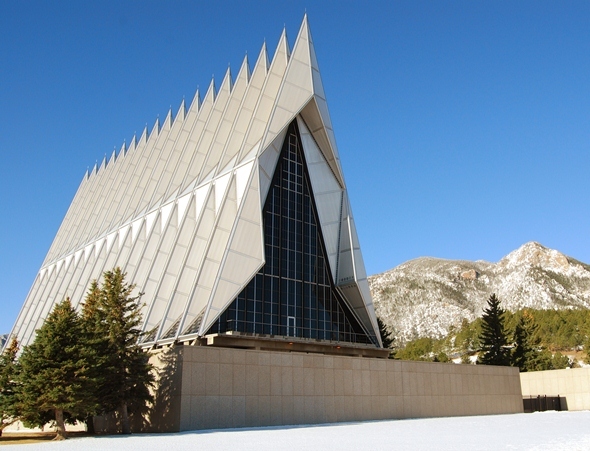 The United States Air Force Academy is located on a 18,000-acre campus north of Colorado Springs and attracts more than 1 million tourists each year. The Barry Goldwater Air Force Academy Visitor Center offers an overview of the academy, and several areas are open to visitors, including the landmark chapel, the fieldhouse, Arnold Hall and the Honor Court. The academy’s buildings were designed by architects Skidmore Owings and Merrill. It’s best to check ahead because access is subject to closure at times for security purposes. Visitors must enter through the North Gate, Exit 156B on Interstate 25, which is 14 miles north of downtown Colorado Springs. Visitors must have a photo identification. For more information, call the Visitor Center at 719-333-2025 or send an e-mail. The Visitor’s Center is open from 9 a.m. to 5 p.m.